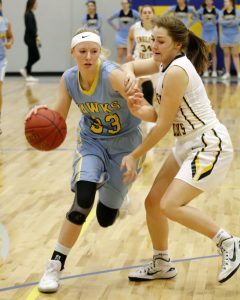 The Lynnville-Sully girls came off Christmas break, tucking another win under their belts after defeating the English Valleys Bears 52-29 on Friday, Jan. 5. The Hawks jumped on the Bears early, allowing only two points in the first quarter and leading 29-11 at the half. The Hawks maintained their lead, and the game ended 52-29. Sophomore Mallory Loftus led in scoring with 13 points. Junior Carson Fisk had a double-double with 12 points and 11 rebounds. Senior Mariah Vos put up 11 points and was one rebound short of a double-double. Both Vos and Fisk swiped three steals. Freshman Krystal Van Dyke chipped in four points. "I thought we played good team basketball," said L-S Head Coach Jerry Hulsing. "Defensively, we were ready to help when needed and did an okay job of communicating." Junior Shiloh Cunningham contributed seven of the Hawks' 11 free throws, and senior Camryn Russell cashed in the only made three-pointer of the night. 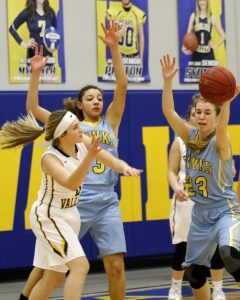 Senior Camryn Russell steals the ball from English Valleys with help on defense from Junior Shiloh Cunninham. "Offensively, we moved the ball fairly well and got some good looks from our offense," commented Hulsing. "We missed several bunnies, and I thought we rushed our outside shots and we need to be better at the line." The L-S girls are in the midst of a week-long break. They’ll host Grand View Christian (5-7) this Friday and then be at Montezuma (10-2) next Tuesday, Jan.16. The Hawks will be looking to improve on their first meeting with Montezuma early in the season when L-S fell 50-25. Sophomore Mallory Loftus protects the ball from her English Valleys defender in Friday's 52-29 road victory.